Luxury timepieces are built to carry on ticking forever more, however this doesn’t mean that they don’t need a little TLC every now and again. Here one of our very own watch experts explains why regularly servicing your watch is something you should be thinking about! Why is watch servicing important? Every watchmaker knows that a luxury timepiece is a truly special gift to receive, with the unique personalities of each individual brand and the style of watch hand-picked to match the characteristics of the wearer perfectly. It’s a gift that is designed to be treasured forever. However, if you want your watch to last a lifetime watch servicing is something you really need to consider! “A wristwatch is a magnificent work of art. With many tiny moving parts, each with their own specific purpose, they are incredible feats of engineering. However, as your beloved wristwatch becomes a part of your routine, and an important companion for day to day activities, it is easy to forget that these precision timepieces also require regular maintenance if they are going to stand the test of time. The humble wristwatch is a beautiful mechanism and contains a system of intricate mechanical parts all working in tandem. (Yes, even your quartz battery powered watch contains small wheels and pinions, continually moving!). They are all oiled with various oils, depending on their speed and friction and these oils only have a limited life before they start to degrade. This can ultimately cause the watch movement to consume too much power from the battery in order to keep these wheels moving. Batteries themselves, also only have a limited lifetime. After this “use by date” they can begin to leak battery acid into the movement and cause considerable damage to the circuit, coil and other parts. Watch houses recommend a service to the movement every 3-5 years. If we consider how regularly the wheels are in motion inside the movement, this seems like an extremely generous amount of time! From time to time I speak with clients who relay fascinating tales of wearing their trusty wristwatches for 10 years or more and (other than a simple battery change) it has never needed any further work or maintenance and is still keeping extremely good time. This can indeed be the case, but just because the watch appears to be functioning correctly, this does not mean that there is not considerable wear taking place within the movement due to degrading lubricants and aging parts. Although this may not be apparent at the time, if the watch does start malfunctioning in the future the cost of the service could be much greater than it would have been if regular maintenance had been undertaken in the past. This is due to the cost of extra parts and repair charges for the excessive wear, which could have been picked up at an earlier stage when the cost would have been much less. But what does a watch servicing consist of? Firstly, the watch is inspected, tested and preliminary diagnostics take place. A skilled specialist watchmaker will then take the entire watch apart (averaging about 130 parts, but usually much more). Some old, worn or broken parts are changed for new, however some are refinished by hand depending on the brand and calibre. The watch parts are cleaned and the whole watch is carefully re-assembled and precisely oiled. The watchmaker then makes fine timing adjustments and tests the watches various functions (usually over a few days). Finally, the dial and hands are reassembled onto the movement and the watch is placed in its case. Further testing and a lengthy QC process is administered before the watch is finally ready to be returned to the client. Occasionally a polish or valet to the case and bracelet may also form part of the service process. When we look at the service process broken down in this way it is easy to justify the cost of this important investment into the future running of your beloved wristwatch and sentimental heirloom. 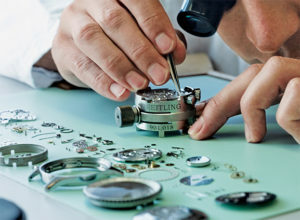 Our watchmakers complete a lengthy training process to become skilled in servicing specific watch movements and receive many years of watchmaking training, perfecting hand skills, followed by specific brand training and on-going training for specific movement calibres and complex repair processes. Watch houses give a warranty with their services however, as a watch becomes older it will inevitably need a service more often. 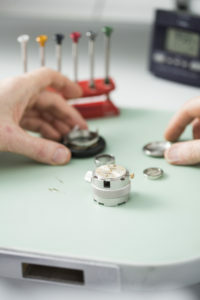 Thank you for taking the time to read Bethan’s insight into watch servicing! Follow our latest news on Twitter, Facebook, Instagram, YouTube and Pinterest, or if you have any questions please pop us an email at info@laingsuk.com.